OK…so I’m a sucker for the newest cheap radio that comes along. My collection of radios includes many portables which cost under $100 and some under $50…some of them can actually be fun to play around with, such as the Degen 312 and Kaito WRX-911. But when I hear about a new radio in the sub $25 category it arouses my curiosity enough that I throw common sense out the window and try it out just to see if it might be an undiscovered jewel. 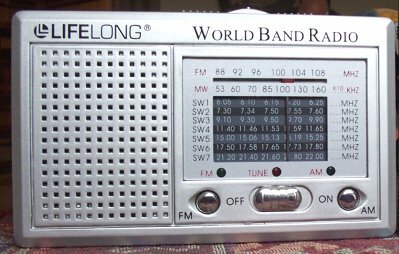 So it happened with the Lifelong World Band Radio, sold at Walgreens. There’s been some murmuring about it and a few people asked if I would check one out. Marked at $19.95, it has been on sale for $15.99 recently and at that price how could I resist? After all – 7 Shortwave Bands plus AM & Fm for $16…that’s about $2.50 a band. I could skip coffee and save more than that! I discovered that Walgreens has a whole range of small electronic products with the Lifelong name on them, from small retro-styled portable AM/FM radios to Walkman type stuff, a Shower Radio, a Sports Radio etc. In fact, it was amazing to see a World Band radio here at all. Other than the Bell & Howell which generally sells for $9.95 I know of no other multi-band portable this inexpensive. My hopes with these inexpensive, small portables is that I will find decent performance in a package small enough to take anywhere and cheap enough to not have to worry about loss or damage. For a spur-of-the-moment purchase or a gift it may be someone’s first sw portable…what will they find when the open the blister pack? One positive note is that there is a small instruction sheet which gives some brief info about SW (AM and FM are for local listening while SW is for long distance listening – that sort of thing), and lists some frequencies for major World Broadcasters, such as BBC, DW, CRI etc. Comparing the listings with my own loggings I found them to be mostly out of date or for other areas of the world, but that’s typical of most such radio datasheets…this literature is the same the world over so is necessarily generalized and less than helpful. My suspicions that the Lifelong would not become my next favorite portable began even before I put the two AA batteries (not included) into the radio…I almost had to break the thing to get them to snap into it. It seems that the plastic opening for the battery compartment is just a wee bit too short, and I could not exert enough pressure using just my fingers to get the second battery to drop into place. I had to get a screwdriver and FORCE it down into position. I am very lucky the case didn’t shatter into tiny fragments under the pressure I was exerting with the screwdriver and please don’t ask how I plan to get those batteries out in the future. I was about to take the back off the radio to get the batteries into it, but discovered only one screw which seems to hold the rod antenna. Maybe the case is glued together? I certainly never envisioned that installing the batteries would be an item to comment on in a review but this really amazed me. Strike 1! However, I did finally get the batteries in there. I slid the power button to the right and was instantly greeted by a loud local FM station. “Great”, I thought…”at least the FM is working and it can play rather loudly,” although the sound was a bit screechy and shrill for my tastes. I tuned up and down the band and was able to hear my local FM’s without any problem. The local stations all crowded into one another with no blank spots between them, but I don’t expect distant FM reception on a radio like this anyway. It was mono in headphones as well (no ear buds provided). Next it was time to try AM, but I encountered my next problem. I couldn’t move the band switch…a slider on the top of the case. Try as I might it just would not budge…it felt stuck in place. I pressed harder and harder and it finally gave way, snapping all the way to the opposite end of its range. Once again I had to exert enough force that it felt as if something would break…but it finally gave way and moved. Strike 2! I jockeyed it back to the am position. I found I was able to pick up the local AM’s but with more noise than I deemed listenable. My favorite semi-local am signal is a 50 KW on 1080 about 15 miles away…it was down in the noise…you wouldn’t want to listen to it for long. A very local 5 KW about 4-5 miles away came in fine, so I would rate this am as for strong locals only. Sensitivity is low enough that nighttime skip didn’t affect reception much…only a couple of signals that were incredibly strong on other radios could be heard. I tried my 100 mile distant daytime test signals, which come in listenably on other radios…they were a faint noise only…no audio was decipherable on the Lifelong. For SW I checked a couple of frequencies that were booming in at the moment… the BBC on 15190 (about 10 over S-9 on my reference tabletop) and a stronger US SW which was about 20 db over S-9. I could hear the BBC on 15190 but it was faint at best. The US signal was clear and listenable, so again, sw sensitivity is low enough that only very strong signals will be comfortable to listen to. Strike 3! 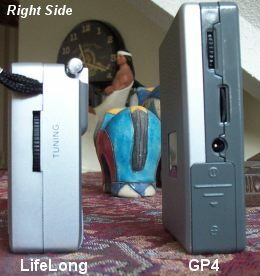 I did a quick comparison with my GP-4 (available from countycomm.com for about $20) to see how they compared. The GP-4 was only a hair better on am than the Lifelong…these radios just don’t have a ferrite bar antenna that’s long enough to be effective, and the circuitry obviously is not sensitive enough to help make up for this shortcoming. On SW the GP-4 was somewhat more sensitive…still not a barn-burner (which you wouldn’t expect for the price), but it could bring in several average strength signals I just could not find on the Lifelong. Of course, the GP-4 also offers digital frequency readout which seems hard to believe at its $20 price point, so it’s considerably easier to find a particular frequency than it is on any small analog portable. The Lifelong and the GP-4 both suffer from hand capacitance effects…their tuning and reception usually changes when you put them down. Again, not surprising when you consider the massive size of one’s hand compared to the total size of the circuitry in these radios. They both perform best when you’ve holding them. Dial Calibration: Often a sore spot with cheap radios, the Lifelong was not bad in this respect…some parts of the sw bands were off by up to about 20%, but most bands were closer to correct, although the markings are so crude you are really guessing, even on am. Trying to judge dial accuracy with a dial that runs from 1300-1600 in one small segment is guesswork at best. Bottom Line: Well I hate to be harsh, but the best thing I can say about the Lifelong is that you will get sound out of it on all bands…assuming you can get the batteries into it without breaking it! Perhaps this “defect” varies from sample to sample, but for such a rudimentary function as installing the batteries, it certainly does not bode well. 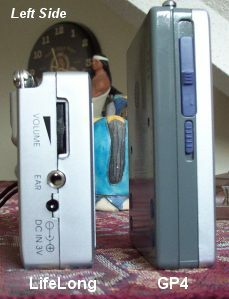 The Lifelong also has the shrillest, harshest sound of any of my small portables, except possibly the Bell & Howell, making the GP-4 sound almost mellow by comparison. I can’t recommend the Lifelong for any reason as I think you will be more frustrated with it than anything else. 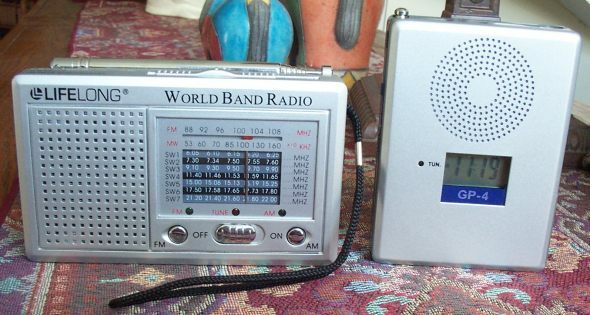 For an additional $5 the GP-4 (while still only a radio for local am’s and strong sw stations) nevertheless seems like a “real” radio compared to the Lifelong which seems like the kind of cheap toy that gets broken and tossed within a few days. 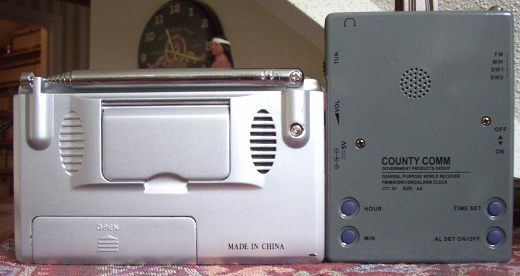 Also, for about $25 you can get a Kaito WRX-911 or a Degen DE312…both of which summarily trounce the Lifelong and the GP-4, not only in terms of reception, but sound quality, build quality and ease of use. Both the WRX-911 and the DE312 are just a bit larger…about 3/8” all around, yet their analog dial scales are more than twice as large and detailed as the Lifelong’s. They also feel normal in use…their tiny controls at least operate smoothly and with a decent “feel”. The Lifelong’s band Switch is nearly impossible to use…you end up trying to slide in left and right until you end up on the right band. Another new radio in this category is the Degen DE390. This radio sells for $13.90 on eBay plus $12.90 so it comes to about $27 and coming from Degen I’m hopeful it will be at least respectable. It only breaks up it’s analog sw bands into two segments but I would expect it to be able to receive the majors and hopefully your local am’s acceptably. I’ve always said there wasn’t a radio I didn’t like, but now I have to amend that because I’ve found one that has absolutely no redeeming qualities…even $15 is too much to pay for something you will never use. Is the Lifelong absolutely the worst, inexpensive analog sw portable I’ve ever seen? Well, I’ve got one other candidate…the almost famous Bell & Howell. I got mine for $9.95 plus shipping. Some owners have waxed enthusiastic over this small portable but my sample left me cold. My Bell & Howell is rather miserable. Sound quality can be likened to a kazoo with a crack in it and dial calibration is so far off that some stations come in on the band adjacent to where they should be…now that’s BAD dial calibration! I’m sure some samples are better than this, but even so, there are so many choices for about $5 – $10 more that are real radios that there is no reason to recommend either the Lifelong or the Bell & Howell.